"There are times Galen Rupp looks as if he's toying with opponents." 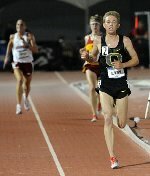 - Associated Press intro to their story on Galen Rupp winning the NCAA 10k title in fine form on Thursday night. Shawn Forrest and Sam Chelanga threw blow after blow at Rupp in a very exciting race, but Rupp answered the challenge with ease. Rupp's win was needed by the Oregon Ducks as Matt Centrowitz, Jr, the #1 seed in the 1,500, finished last in his heat, tightening up the team competition. The link above goes to our recap of Thursday's action where we have a link to the AP article which you can find here. WOW: Andrew Wheating jogs a 1:46.2!! *Youth Runners Take Note: Interview With Kevin Sullivan He's been at the top for 20 years. *Interview With 31-Year-Old Sprint Veteran Shawn Crawford Crawford is a really interesting interview. *Solomon Haile vs. Lukas Verzbicas - Clash Headlines 2009 Midwest Distance Gala Boys 2-Mile Field This meet always produces impressive high school and pro times. Usain Bolt Getting A Reported $250,000+ To Run In Toronto The article also has comments from legendary coach Dan Pfaff on Bolt. A Star Rising And A Star Falling? Jelimo: "I want to tell Kenyans that I’m fine and they have nothing to worry about." *Big Meet Taking Place In Poland Wednesday Throwing events are stacked as are the steeple and the hurdles. *Dayron Robles Opens Up And Blanka Vlasic Returns To Action Wednesday In Greece Robles is looking to get back in form for the 110 hurdles, an event he dominated last year. American David Oliver will be breathing down his back this year. *Berlin Wants Bolt, But Does Bolt Want Berlin? Short answer: NO. Agent says street race idea in Berlin is news to him. *Indian Runner Who Failed Gender Test And Attempted Suicide Now Joins Coaching Ranks Sounds ideal. *Kenyan Press Call Jelimo And Lagat's Performances Worrying Apparently they didn't get much training preparation this year. If they relax and do things right up until Worlds, they should be fine.